Film is still one of the youngest art forms out there. It only began in the early 1900s, but it's grown so much in a short period of time that keeping track of the most influential films is still somewhat of Herculean task. Thankfully, an awesome graphic created by Larry Gormley (via Dave Chensky from SlashFilm), breaks down a couple thousand of the most impactful films, categorized by genre, since the inception of the motion picture. It's a bit convoluted, but this would be something great to have on the wall on your office. It would certainly be a great conversation starter for any household that entertains cinephiles as well. Look below! The website says, "This graphic chronicles the history of feature films from the origins in the 1910s until the present day. 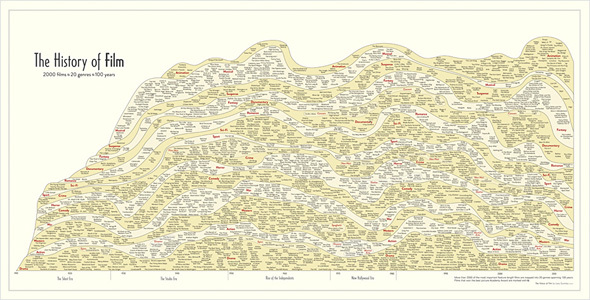 More than 2,000 of the most important feature-length films are mapped into 20 genres spanning 100 years. Films selected to be included have: won important awards such as the best picture Academy Award, achieved critical acclaim according to recognized film critics, are considered to be key genre films by experts, and/or attained box office success." I'd say that makes for a pretty definitive list, though I'm sure there might be some gripes to be voiced as to the films that don't appear on this picture. What a shame that this picture contains a typo. I looked up the film 'From The Manager To The Cross' as I thought it seemed a strange title and low and behold it's 'Manger'. I am also unsure if it's intentional that it contains 'The Thirty Nine Steps' in the drama category and 'The 39 Steps' in suspense. Shame as it's such a nice idea and would have looked great in my new flat! Where the hell is The Avengers??? Probably not there for the same reason Transformers isn't on there... CGI snoozefest, not a very influential piece of work. Way to troll. Coming across as though you understand this list and agree with it, you're suggesting that Avengers didn't deserve to be on the list because it wasn't influential, despite being the highest grossing film. Yet Snakes on a Plane does deserve being on there (I.e. you think it was influential)... And although I did enjoy all Harry Potter films, was every single one influential enough in it's own right?? I think not. Also, Transformers is on the list dumbass. Someone's got sand in their vag. Have to agree with "T Stark" on this one, though Transformers is on the list.